Home > Personal Finance > Paying for College. Are You Prepared? Paying for college requires a solid plan. Assuming you have children who may one day go to college, are you prepared? Is paying for college for your children your obligation or a gift you would like to give them? Do you want to help them avoid student loan debt? Are you doing enough now? 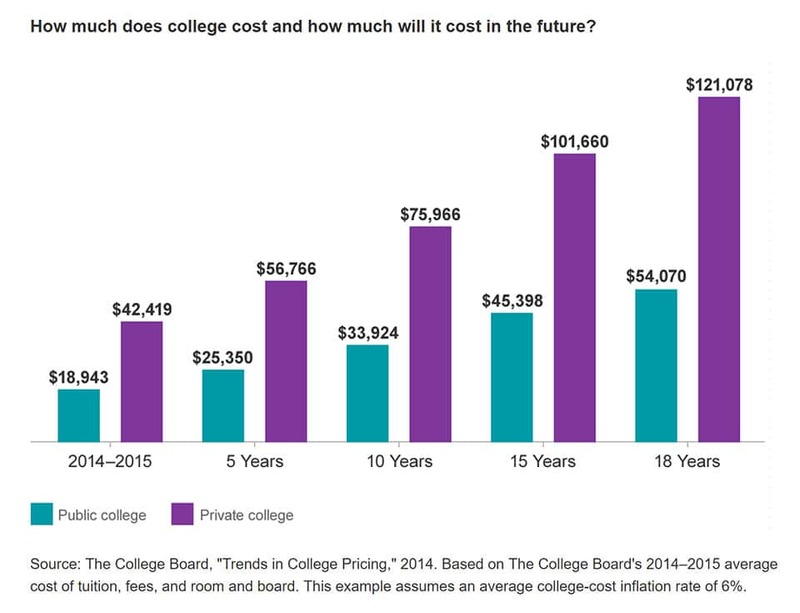 As you have likely already discovered, college costs are frighteningly high. They seem to be increasing further without an end in sight. At the same time, a college education seems to be a requirement for even the most basic white-collar entry-level job. Paying for college 15 years from now will require a staggering sum. If you haven’t tried to estimate how much will be needed for your children’s education, you may start with an online calculator. A 529 account probably is the best option for high-income professionals. We will explore the 529 option in the most detail, but also discuss some alternatives. You can set up a 529 college savings account for your child as soon as they have a social security number. The earlier you contribute, the more time there is for the money to grow through the miracle of compounding. The funds will grow tax-free and can later be withdrawn tax-free for educational expenses. 529 accounts can also now be used for K-12 private school costs. Vanguard now uses a glide path approach to their 529 college savings plans. This automatically creates a less aggressive asset allocation as the student gets closer to college. The glide path is easier and more effective than continually tinkering with the allocation. You do have to choose a path at the outset. There is a conservative, moderate, or aggressive route. Essentially the determinant is the ratio of stocks to bonds. The farther away college is (the younger your child) the more the money will be invested in stocks as opposed to bonds. As they advance into the teenage years the allocation shifts more to bonds. The aggressive path has more equities than the moderate path. The moderate path has more equity investment than the conservative route. If you truly have no idea how to choose, go with the “moderate” choice. There may be more bond investment than you might expect when comparing to your retirement accounts. That is because the time horizon to paying for college is much shorter than for retirement. To give you an idea, I selected some years and allocations from the moderate age-based option. The glide path is a great approach, but not the only way. The main thing is to invest. We can quibble over a percent here or there, but the key factor is the time in the market. If you have children and don’t have college funds set aside, start looking at investment options. The best benefit from the tax-shelter comes from front-loading the 529 with as much as you can as early as you can. The glide path will also ensure you are growing those early dollars with equity investing. Lastly, remember if your investment is too successful and you have excess funds, that is not a problem. You can transfer the funds and pay for someone else’s college. You could help a nephew, grandchild, or even yourself by paying for educational expenses. Many states offer a tax deduction for contributions into that state’s 529 college savings plan. Other states offer something even better – a tax credit. Tax credits are much more valuable than a deduction since it is subtracted from the tax bill you would otherwise owe. The amounts vary by state. Indiana, for example, allows a 20% per year tax credit on a 5K contribution up to a full $1,000 credit per year. Not bad. If you lived in that state, you would lose out by contributing less than $5,000 per year. Look up your state and know the details here. Answer. A plan operated by a state or educational institution, with tax advantages and potentially other incentives to make it easier to save for college and other post-secondary training for a designated beneficiary, such as a child or grandchild. A. Earnings are not subject to federal tax and generally not subject to state tax when used for the qualified education expenses of the designated beneficiary, such as tuition, fees, books, as well as room and board. Contributions to a 529 plan, however, are not deductible. A. Yes. You can set one up and name anyone as a beneficiary — a relative, a friend, even yourself. There are no income restrictions on either you, as the contributor, or the beneficiary. There is also no limit to the number of plans you set up. A. Yes. Contributions cannot exceed the amount necessary to provide for the qualified education expenses of the beneficiary. If you contribute to a 529 plan, however, be aware that there may be gift tax consequences if your contributions, plus any other gifts, to a particular beneficiary, exceed $15,000 during the year (2018). For information on a special rule that applies to contributions to 529 plans, see the instructions for Form 709, United States Gift (and Generation-Skipping Transfer) Tax Return. A. An eligible educational institution is generally any college, university, vocational school, or other postsecondary educational institution eligible to participate in a student aid program administered by the U.S. Department of Education. Most physicians and high-earning professionals have the option of helping their child with expenses out of discretionary income from earnings. Parents are often mid-career and middle-aged at that point. Their earnings may be near peak. 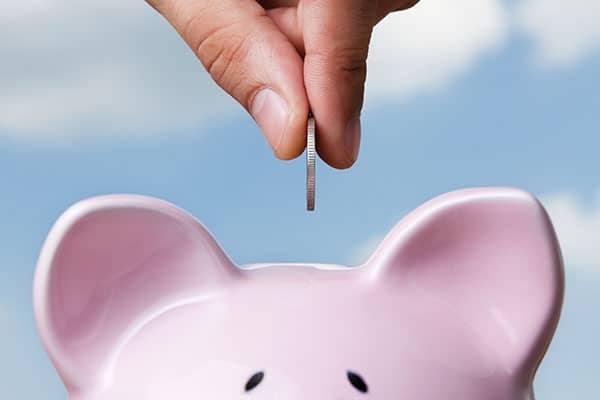 If there isn’t much cash to spare, parents could consider cutting back on other expenses or even retirement contributions for a few years to help. These are often called Coverdell Education Savings Accounts (ESA). Unfortunately, they have income limitations. If you are a medical specialist or even a successful primary care doc you are likely ineligible due to the income limits. If you are working part-time or a resident, you likely will qualify. You can only contribute up to $2,000 per year though, so that isn’t much help. Uniform Gift to Minors Act (UGMA) is basically a fund that will belong to your child when they turn 18. Since it belongs to them, it may affect their financial aid status. You probably make too much for that to matter anyway. There aren’t really tax advantages to this account. You can contribute up to the allowable annual gift tax amount without adding taxes. If you are a high-earning and high-saving physician, you likely have more money in your taxable accounts than in your tax-advantaged accounts. Those funds can be used for your child’s educational expenses. There is no limit, but there isn’t a tax benefit either. You will have to pay tax on any capital gains. You can contribute up to the annual max. It grows tax-free. You can invest in anything you want. And there is no penalty for withdrawing the money if used for educational expenses. The earnings portion may still incur a tax though. The withdrawal will also look like income when it comes to financial aid eligibility. I-bonds are an option. Interest on the bonds is free from state and local tax. If you use the earned interest for educational expenses this money can be exempted from federal tax as well. There are income limits and the bonds must be in a parent’s name, but it is worth checking into. If you know where your child will go to college, a prepaid tuition plan may make sense. These vary by state and university, so investigate the details of your chosen school. You may be sold this approach for college savings. It doesn’t make good sense for most of us. The fees are high and there may be early-withdrawal penalties. This is a lot of what is passed off as “aid.” Loans can be in your name or in your child’s. Either way, they are not a good option. This is available for the struggling middle-class. This should not be your plan as a high-income professional. Set aside the money in one of the vehicles discussed. Encourage your child to get scholarships and to work. Teach them how to live frugally. Cash flow the rest. There is a whole generation of unemployed or under-employed college graduates who are starting life with the student loan monkey on their back. That is not a good way to start a career. With a little planning, you can prevent your child from being one of them. The U.S. government encourages its citizens to become educated. There are many ways those programs could help you. Look into military service, TEACH grants, Public Service Loan Forgiveness, the G.I. Bill, AmeriCorps, and the National Health Service Corps. Will your child need to physically go to a college? Technically, that is no longer required. A college education can now be obtained online. It does take a good internet connection and a boatload of discipline, but it can be done. And for a lot less than a traditional college education. You can explore some of those options here. Community Colleges used to be called Junior College. They are two-year schools that have one and two-year programs for technical training or liberal arts. They still have not overcome their inferiority stigma, but don’t overlook this option. I started my postsecondary education at a Community College. I learned more there than anywhere else. The professors were dedicated teachers and took the time to help struggling students (like me). After receiving my Associate in Science (A.S.) in Liberal Arts, I transferred all of my credits to my state’s most competitive public university. It was great to be able to start as a junior. Two years later I graduated with my B.A. which took my classmates four years and a lot more money to obtain. Will your child be encouraged to work and save? This is optional, but I think they value the education more if they earned some of the money that paid for it. I worked in college. It made me feel productive and valuable. Working also forced me to learn invaluable time management skills. Too many high-income professionals pass over this area thinking they wouldn’t be eligible. There are thousands of grants and scholarships out there. Many are not based on financial need. Help your child to apply for everyone for which they could be eligible. Some schools and states are beginning to waive tuition, especially for community colleges. Even some graduate schools are offering free tuition (e.g. NYU School of Medicine). Many elite schools like MIT have placed all of their content online. Add the word MOOC to your vocabulary. An enterprising student can obtain an education at minimal or no cost. Scott Young got all of the knowledge of a four-year MIT degree in just one year online. Laurie Pickard writes about how to get an MBA at little or no cost. Although the very idea of not going to college may be heresy in over-educated families, it is worth considering. Many of the richest people in the world avoided college or dropped out (think Bill Gates or Mark Zuckerberg). If your student is eager to build a business, travel the world, serve a mission, maybe that is the right choice. What if we used our resources, skills, and connections to help the next generation build creative businesses? Is that so much worse than sitting in Latin class, mastering beer pong, or playing hacky sack on the quad? Well, what do you think? Will you encourage your children to go to college or grad school? How much will you help them financially? Do you have a solid plan in place to ensure you will be able to pay for college? Previous Post Financial Preparedness: Are You Flunking? Next Post Physician Employment Options. Who will be your boss? I do plan on paying for my daughter’s college education (pretty much I had college education paid for me and consider it paying it forward). Whatever is left over (if any) can be used for graduate school if she chooses (she has expressed a desire to go into medicine so we will see). I figure my obligations will stop at undergrad and she will have to fend for herself with grad school. She is in 8th grade now, so time frame is rapidly closing. If you do prepay 5 years and they increase the yearly contribution limit like they did this year by $1k, can you go back and add the difference? Or are you excluded from any further contributions for 5 yrs? My state used to offer prepaid college tuition credits which locks in the rate at current levels but likely because of fiscal reasons, they stopped. Is this a good option if available? A lot of my colleagues share your strategy. They plan to cover undergrad, but maybe not past that. It was a great gift you were given. My parents did not/could not contribute to my college funds at all. I relied on grants, working, loans, scholarships, hustling, investing, etc. It wasn’t easy. Although I don’t want my kids to become spoiled, I want to help them with education costs. I hate to see young people starting out with huge debt loads. I don’t recommend paying 5 years ahead. I don’t think it provides many advantages and just causes restrictions. With gifts being exempt for up to $15K per year you can just contribute annually. If you are married, you can each give $15K per year to each kid ($30K) without worrying about gift taxes. If you already pre-paid you may want to check with your fund, your state, or your CPA about the options available to you. There are two kinds of 529 accounts. The savings type is what I recommend because it is the most flexible. The pre-paid state plans come with problems. It can restrict educational options. Also, I think only 3 states (last time I checked) fully guarantee those funds. The other states (nine or so) just hold a record of a tuition waiver but don’t insure it or fund it fully. This caused problems in Alabama when the state had to change its program due to the budget issue. I hate to rain down on anyone’s parade. My oldest just graduated from an out of state Big 10 University last Saturday. The chart above for a 4 year public school is way low. Tuition is double that listed. 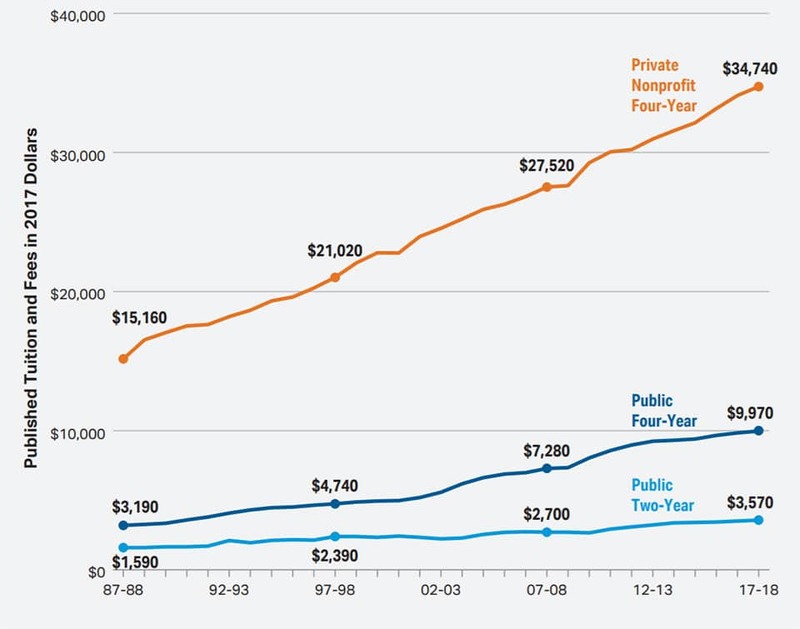 The chart is also for tuition only, and room and board easily doubles the cost. I am done with him though at a cost of about $125,000. Our younger son is at the in state Big 10 University. He finished his first year and we move him in next weekend for his second year. He, too, will get out for about the same cost of $125,000. I really don’t know how you can do it for less than about $30,000 a year. Your “rain” is quite welcome Delivery Boy! It is great to hear from people on the “other side” who have actually done it. Yes, this is discussing tuition only. There are A LOT of other costs involved with supporting a person completely – even in addition to room and board. What about insurance, phone service etc.? It all adds up. Yes, out of state public schools can be as much or more than an elite private school. I know a surgeon in Indiana who had one daughter at U of M (Michigan – state school) and one at Yale. The U of M cost him $50K per year which is more than Yale set him back. I used to recommend $100K per 529, but after taking a survey of my colleagues I raised that general advice to $150K per kid. Some may need $200K or more if they plan to cover grad school as well. We all have to figure out our own numbers. The more informed we are the more we can prepare. Is that $150k/kid in today’s dollars at time of college? I am a little behind the 8 ball with my daughter (about to turn 13, starting 8th grade) because when I lost her in custody battle and she went to England from age 4-11 I didn’t contribute at all to her 529 plan. When I won full custody back, there was about 35k in funds. Current level is just at $68.2k. I do know she has 25k British pounds in a bond for college plan given by her maternal grandparents, so that definitely helps some. But still feel like I am behind where I should be. Yes, it is 150k per kid in today’s dollars. It is just a rule of thumb. I actually do not like rules of thumb since everyone is different, but that is what people are always asking me to provide. It is at least a starting point. If you don’t have that, I would not panic. You’ll be fine. Just save what you can. The later you start saving the less benefit there is to using a 529. You may choose to take money from other accounts. Explore some of the alternative options I listed in this post. We all just have to do the best we can with the crazy life we each are given . You really should plan on $150,000 in today’s dollars per child. My older son had $10,000 in academic scholarships which I am not accounting for, and my figure above is out-of-pocket actual cost to us. I also left out all of our back and forth trips, football weekends, etc. He also studied at Oxford for a semester and I have left out those added living costs and travel expenses. I will tell you the best thing we did to afford it was to create a taxable account and rely on that. Yes, we had 529 money and other money set aside, but the taxable account which we contributed to is what made it work without missing a beat. In fact, the vast majority of our contributions earmarked for our kids went into the taxable account. I could not (and still can’t) get my hands around the advice to save, save, save in these protected accounts, then pay it down to $0 during the college years. Why not treat it as a mini retirement account? We were able to save enough in taxable accounts to pull out about 4% per year, use the 529 money, and pay the rest out of cash flow to easily pay it as we have went along. The taxable account had about $500,000 when the older started his freshman year. It still has $500,000 through growth and using the 4% rule on that money. Again, spending all that money you put aside in 529 accounts or other protected accounts down to $0 makes no sense to me. Wow. That is brilliant advice Delivery Boy. The thought of not spending it down during college never even crossed my mind. I had come across a similar concept for the HSA by treating it as a stealth IRA. So your plans are similar for the 529? Is your intention to use that for your own money needs in retirement or is this going to be some legacy educational benefit that can be used by grandkids etc? I just did some research. For you to be able to withdraw your 529 money, it HAS to be in the same calendar year as the educational expense to be a qualified distribution. Otherwise when withdrawn in retirement for example, it will be a nonqualified deduction and have penalties. I was hoping this would have been treated like an HSA and you can save receipts and just let it grow and withdraw tax free later, but unfortunately it is not treated like that. It is our taxable account that we saved heavily in for the kids education. We did/do have 529 accounts and Coverdell accounts too. The taxable account which we had earmarked for the kids schooling is the account we applied and continue to apply the 4% rule to. We supplement the 4% monies from our taxable account with the college savings account. My point was that we made a decision about 10 years before the oldest began college that it was nonsense to save all of these monies in these protected accounts and then have to spend them to $0. It is crazy to let the tax tail wag the dog. 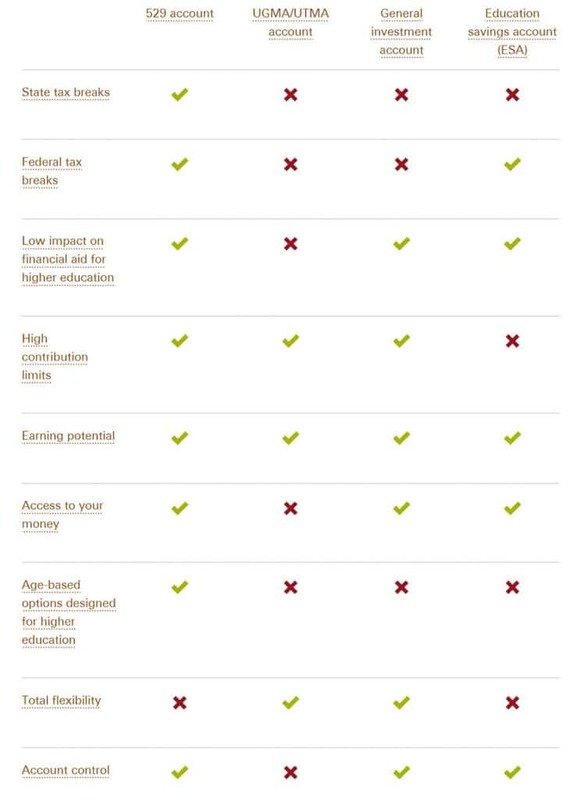 We made the decision that efficient index funds in a taxable account was a far better way to save and pay for college. You have far more control over the money in so many good ways we believed it far out weighed all other considerations. You might want to recheck the 529 account uses though. I am the trustee. I can let it sit there and compound. I can transfer it back to myself if I want to use it for school use if I want to go to school in retirement. My sons can keep it and let it compound for their kids use too. Again, I believe it is insane to follow the conventional wisdom to pay monies in any accounts to $0. The $500,000 in our taxable account earmarked for college education has now kicked out $100,000 over these 5 years using the 4% rule and it is still worth $500,000 today. You need to write on your blog what I believe is “The Single Best Way to Pay for College and Retire Early” as I will have paid for college without missing a beat. I am going to float over to your blog after you write this. Thanks Delivery Boy for the clarification. That makes perfect sense now that it was a taxable account you were referring to and not a 529. Definitely knew about 529 rules of using the money on yourself for education on passing it down to other relations if not used by the original beneficiary. That is a great suggestion/title for a post. I can certainly create one based on the comments you provided. Also would you be interested in writing an excerpt I can use in the post (or if you want it could be a full guest post). 2. Lehigh- 1 year at $50000. Transferred to instate school- still $30,000 a year . Total $140,000. Doing well in his career. So $580,000 total. Now paying for med school at $80,000 a year for tuition and living costs. We can afford to do this so we do, but it is EXPENSIVE . Thank you so much for sharing your real-world numbers. That is so much more valuable than my reading tables of data or speculating about future costs. It is too bad it all costs so much. But I’m glad you are able to provide those high-level educations for your children. I can’t think of a better use of financial resources. My kids went to college for a total cost of $52,000 and $103,000. They were in college overlapping as they were 2 years apart. We paid for the entire bill. We did it by paying off our house. The old house payment was big enough to cover the cost of college. If you just pay off the house, you can likely use the payment you were making to cover college. And when it’s over, you have a free and clear house and free and clear kids. I agree that doctors should be able to cashflow much of their children’s education. This is a lot easier for those who are debt-free.